Probably sailor made| this handsome American marquetry box is signed in inlay inside the lid B. Robinson. The pieced details on the stepped top and sides is complex| varied| small scale and finely done. There are triangular inserts of tumbling blocks| American shields| and rows of zigzags across the slightly canted surface of the lid. On the box sides are double nine patch diamonds similar to quilt patterns| and striped "piping" to accent the edges. The name on the interior lid is accented with inlaid white stars. Original surface and brass hinges. 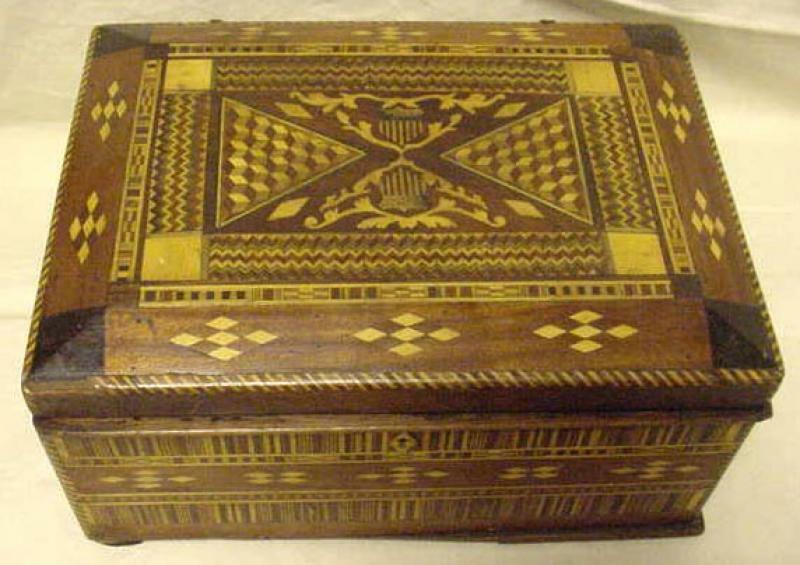 The interior tray is divided into sections to hold jewelry or trinkets. There is a minor edge loss of wood about 3" long.